The little town of Genoa, Nevada is the oldest established town in the state, having been settled in 1851. First known as Mormon Station it was a supply town for the early settlers who came to raise crops and cattle on the fertile soil along the Carson River Valley. The town has changed little in the past 150 years. The old feed store is now an antique shop and "The Oldest Bar in Nevada" is still serving drinks in the same brick building that miners and ranchers surely used in the 1860's. But what has changed here in Genoa is the fact that it is now the home to great golf as well as wonderful scenery on the eastern slope of the Sierra Nevada range. 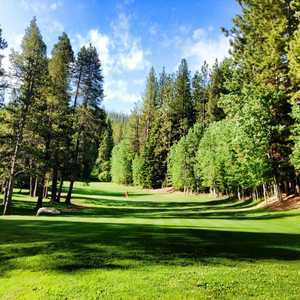 This little town rests at the base of the Sierra just 18 miles from Lake Tahoe and draws players to the intriguing course that is the Golf Club at Genoa Lakes. This 18-hole course is laid into a maze of wetlands, lakes, and cottonwoods along the Carson River and presents one of the best tests of golf in the entire state of Nevada. 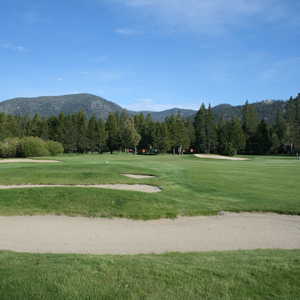 Genoa Lakes Golf Club is the product of a design collaboration between John Harbottle III, a young golf architect whose reputation has grown nationally since the course opened in 1994, and PGA Tour Player Peter Jacobsen, who has become a dedicated designer in his own right since this first project. What the two have created is a long course that puts a premium on long accurate driving to negotiate the abundance of water and wetlands that come into play on 13 of the 18 holes. The Golf Club at Genoa Lakes was an immediate eye opener upon completion. The blend of strong shot values, great conditioning, the languid wetland, setting, and the massive mountain backdrops that dominate the scenery all combine to leave a golfer hoping for more. The course was rated the fourth best new public golf course in 1994 by Golf Digest and in 1995 was rated the third best golf course in the state. It remains in the top five today and has embarked on an ambitious renovation program to upgrade it even more. Genoa Lakes was purchased last fall by Mario Antoci, the former C.E.O. of American Federal Savings, who has been bitted by the golf bug to the point that he wanted to make his mark in the game. Antoci is in the process of pouring $8 million into not only the course itself, but also building a new clubhouse overlooking the 18th hole, a state of the art golf learning center by the improved driving range, and a consolidation of dining and convention uses in the existing clubhouse. Antoci's mission is to transform Genoa Lakes so that it will be perceived as the best golf club in Northern Nevada. On the golf course itself it is his desire to upgrade the conditions to tournament quality on a daily basis. The beginnings of this effort are already evident as new white sand is being added to bunkers and upgrades to irrigation is under way. Another step in this process was the hiring of P.G.A. Head Professional Lou Eiguren as Director of Golf. Eiguren has a national reputation as one of the best professionals in the business and is well known in the West after serving as head professional at Wolf Run, Edgewood at Tahoe, and the Olympic Club in San Francisco. What doesn't need to be tampered with is the layout itself. Harbottle III worked under Pete Dye for 10 years before branching out on his own and the Dye influence can be seen in steep bunker faces and a real premium placed on shot quality. But one of the finest touches to this challenging course is the addition of bail out areas at almost every green so that a player is given several options to get to the hole. This is important on a course with as many carries as there are at Genoa Lakes. "This golf course is just a great challenge , but it is extremely fair, which players love to come back here for", Eiguren said. Genoa Lakes offers four tees and plays to 5,008 yards from the forward blocks all the way to 7,263 yards at the championship tees. The middle blocks play to 5,969 yards and the tournament tees sets the course at 6,703 yards. Be sure to choose the right tees, as there is a lot of carries over water here. You want to be very accurate up to 200 yards to play from the tournament tees. The forward tees are placed over all of the carries, which not only explains the 900 yard difference in length, also makes this course very playable for the short hitter. The course opens with a benign par 4 that is a perfect warm-up hole but once you reach the second tee the presence of water is evident. This 518-yard par 5 has the tee box on an island of land surrounded by water and wetlands. This combination of lakes, willows, wetlands, and large greens blend to create the challenge that is Genoa Lakes. The creative design philosophy of Harbottle comes through on each hole. Harbottle likes to make the player think on the tee box before they hit their shot and consider every possibility. Some holes will have water only 100 yards in front of the tee. On others, it may take a 210 yard shot to clear a stream. This forces players to be aware throughout the round. Another clever feature is the creation of bailout areas around nearly every green site. Harbottle and Jacobsen shape in wide areas either left or right of each hole so that the lesser player can get their ball around and score, while at the same time providing challenging and well protected targets for the stronger player. This is not an easy thing to do but these two designers did an excellent job of this at Genoa. The fourth hole is a great example of both facets of design. A creek cuts across the fairway on this par four, 210 yards off of the tournament tees. If you lay up short, you are left with a 180 yard approach to a well bunkered green. If you want to carry the creek, you are rewarded with a great angle into the pin. Then, as you line up your approach shot, there is an ample bail out area to the right where you can actually run the ball up to the green. If you are going to attack the pin, you have got to carry over the larges, deep bunker. 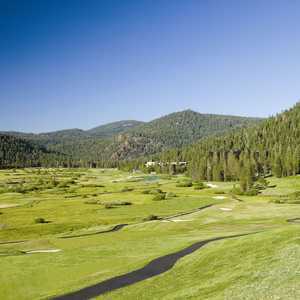 Throughout the front nine, the backdrop of the eastern slope of the Sierra offers incredible views from every tee. The course twists and turns so you get views in every direction but the massive vista of Freel Peak is a dominant feature that continually grabs your attention here. The Carson River comes into play on the back nine and you develop a sense of familiarity with the river as you cross it five times on the back nine. After ten holes from the tournament tees, you can just imagine the test from the championship tees. PGA Tour Player Jacobsen put in a lot of input on the placement of these back tees. You want to wander back to see the challenge he has created on some of the holes, especially on 15, 16, and 18. After the devilish, par 3 12th hole of only 130 yards over wetlands and a pond, you come to the massive par 5 13th hole. This hole is 652 yards from the tips and 589 yards from the championship tees. When the course first opened this was the longest hole in Nevada. There is no water on this hole and you get the breeze at your back but it just take three solid shots to get to the green. This green is very exposed to wind and sun and dries out, so come in with a high soft shot to keep the ball from running through the green..
Good golf courses should have strong finishes and Genoa Lakes is no exception. 16 is a 400-yard par 4 with your tee shot having to carry 150 yards over a deep wetland. A lake on the left protects the green and the severely sloped green makes two putts a challenge. The 17th hole is a 480-yard par 5 that is set up by a good drive. The green sweeps to the right and is protected by a series of deep bunkers that litter the right side f the approach from 60 yards on in. If you are going for it in two, remember that the green is huge. Harbottle and Jacobsen again provide a bail out area to the left. In fact, left of the green there is tons of room. This green has a huge dip in the middle so make sure you get your shot to the right level on your approach. The 18th is just a beast. The huge new clubhouse stands out majestically in the distance and Freel Peak rises above it. But a huge lake separates you from the fairway. You need to rip another sterling drive to clear the water here on this 441-yard par 4. Up at the green, keep in mind that the lake runs all the way up the left side and a bad hook can end up wet. This green slopes from right to left and back to front so it will accept a long approach shot. This hole is also clear of trouble in the front, so you can run a shot into this green. Make a few putts here and you can wrap up your round in style. This is a golf course that can be harsh but also be very memorable if you are hitting the ball well. But even if you don't, Genoa Lakes is a golf course that tantalizes you enough that you will want to come play it again no matter what you shoot here. Keep in mind that the afternoon breezes are common in the Carson Valley. The wind usually kicks up around 2 p.m. so an early tee time is a good idea. Directions: From South Lake Tahoe take highway 50 to Kingsbury Grade (Rte 207) and go east. At the base of the pass go left on Foothills Drive. The golf course is 1 mile past the town on Genoa Lakes Drive. From Reno go south on rte 395 to Jacks Valley Road and turn right. The golf course is five miles on left. Twilight rate - $50 after 2 p.m. Mon-Thurs.